The circulation of the magazine fluctuated, but it reached tens of thousands, with 25,000 issues printed weekly in 1934, and and peaking at 100,000 issues printed in December 1936. The New Masses, Inc. 39 West Eighth Street, New York, NY. 11”X14,” 32 pages, 4 columns, colored ed. (May 1926 – Oct. 1926). 9⅓”X12¼,” 32 pages, black ink. (Nov. 1926 – Sept. 1928). 9&13/16”X11¾,” 24 pages, black ink. (October 1928 – ?). Joseph Freeman (1926 – 1927). E.H. Little Library, Davidson College; Holt Labor Library of San Francisco; Stanford University’s Hoover Library. PDF Archive at Marxists.org. Mike Gold and Joseph Freeman founded New Masses in 1926 with explicit intentions to recapture the characteristics of Max Eastman and Floyd Dell’s The Masses, a magazine both Gold and Freeman enjoyed and contributed to in their youth. 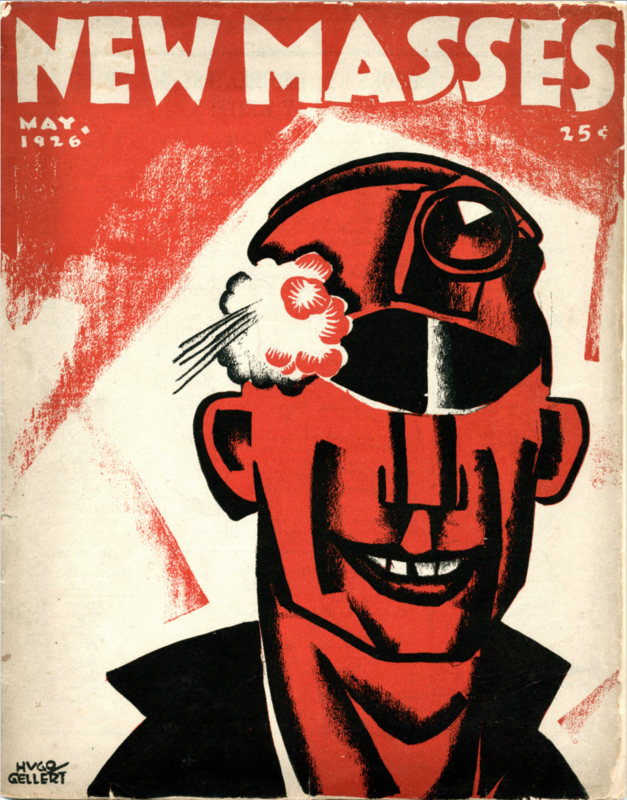 New Masses’ contents included prose, poetry, editorials, reviews, and letters, often with a leftist bend. The magazine was distinguished by its support of the visual arts, publishing “acerbic cartoons and mordant political drawings” (Langa 25), as well as reproductions of prints and paintings that addressed relevant social issues. New Masses published monthly in 1926 until it went weekly in January 1934. The magazine tackled political topics such as labor unions, birth control, and civil rights, with long time contributing editors such as Sherwood Anderson, Art Young, Claude Mckay, John Dos Passos, Floyd Dell, and Carl Sandburg. Other notable writers include Langston Hughes, William Carlos Williams, and Ernest Hemingway. Gold and others wanted the magazine to be “interesting above everything else” (Klein 70), in ways that came across as youthful, new, biting, and brave, but they were by no means in pursuit of beauty. Gold continued as the central editor for New Masses until 1934, and the magazine published its last issue on January 12, 1948. “Is this the magazine our prospectuses talked about? We are not so sure. This, however, is undoubtedly the editorial which, in all our prospectuses, we promised faithfully not to write. As to the magazine, we regard it with almost complete detachment and a good deal of critical interest, because we didn’t make it ourselves. We were confident that somewhere in America a NEW MASSES existed, if only as a frustrated desire. To materialize it, all that was needed was to make a certain number of prosaic editorial motions. We made the motions, material poured in, and we sent our first issue to the printer. Next month we shall make, experimentally, slightly different motions, and a somewhat different NEW MASSES will blossom profanely on the news-stands in the midst of our respectable contemporaries, the whiz-bangs, the success-liturgies, the household aphrodisiacs, the snob-baedekkers and the department store catalogues. It’s an exciting game, and we’d like very much to draw you, our readers, into it. What would you like to see in the NEW MASSES? Do you want more cartoons? More labor stories? More satire—fictions—poetry? How about criticism of books, theatre, art music, the movies? How would you feel if the NEW MASSES went in for some confession articles? America is going through a queer period of stock-taking. Maybe we’ll get some well-known tired radicals to tell what made them tired; or induce some quite unknown people, who are, however, rich both in experience and in honesty, to describe their experience in print. Mike Gold was the pen name for Jewish American writer Itzok Isaac Granich, who was born to Romanian parents in the Lower East Side of New York City. He published a poem in 1914 in Masses, and soon thereafter fell into the inner circle of Floyd Dell and Max Eastman, contributing regularly to the magazine at the age of only twenty-one. Gold would later recognize Dell and Eastman as his teachers. Two of Gold’s most notable publications were his semi-autobiographical novel Jews Without Money, published in 1930, and an article in New Masses titled “Gertrude Stein: A Literary Idiot.” Gold was often fierce in his writing and recognized later on as a strong voice in the Communist party. Joseph Freeman was born in the village of Piratin, Ukraine, which was under control of the Russian Empire at the time. Freeman, of Jewish decent, lived through a period of strong anti-Semitism and pogroms across the Russian Empire. Freeman’s family fled Russia in 1904 and emigrated to the United States, where Freeman became a naturalized citizen in 1920. Freeman graduated from Columbia University in 1919 and worked as a writer or editor for several magazines in the United States and abroad. Freeman co-founded New Masses with Mike Gold and acted as an international correspondent in Moscow for its first year of publication. Freeman also co-founded The Liberator, but would eventually leave the Communist party and work in the private sector for the later part of his life. Anderson, Jervis. A. Philip Randolph. A Biographical Portrait. [1st ed.]. New York: Harcourt Brace Jovanovich, 1973. Print. A Harvest book, HB 280. Bassett, John Earl. Harlem in Review : Critical Reactions to Black American Writers, 1917-1939. Susquehanna University Press, 1992. Print. Burnett, Colin. “The “Albert Maltz Affair” And The Debate Over Para-Marxist Formalism In New Masses, 1945–1946.” Journal Of American Studies 48.1 (2014): 223-250. Academic Search Complete. Web. 18 Sept. 2015. Coyle, Michael. Ezra Pound and African American Modernism.Orono, Me. : National Poetry Foundation, 2001. Print. Ezra Pound scholarship series; Ezra Pound scholarship series. Gold, Michael, et al. New Masses. New York, 1926. Print. Goodman, Martin, ed. “New Masses.” Marxists Internet Archive. Web. 15 Jun 2016. Klein, Marcus. Foreigners : The Making of American Literature, 1900-1940. Chicago: The University of Chicago Press, 1981. Print. Langa, Helen. “‘At Least Half The Pages Will Consist Of Pictures’: New Masses And Politicized Visual Art.” American Periodicals: A Journal Of History, Criticism, And Bibliography 21.1 (2011): 24-49. MLA International Bibliography. Web. 18 Sept. 2015. Tadié, Benoît. “The Masses Speak: The Masses (1911-17); The Liberator (1918-24); New Masses (1926-48); And Masses & Mainstream (1948-63).” The Oxford Critical and Cultural History of Modernist Magazines: Volume II, North America 1894-1960. 831-856. Oxford, England: Oxford UP, 2012. MLA International Bibliography. Web. 18 Sept. 2015. Therborn, G. “New Masses?” New Left Review 85 (2014): 7-18. Print. Wald, Alan M. Exiles from a Future Time : The Forging of the Mid-Twentieth-Century Literary Left. Chapel Hill: University of North Carolina Press, 2002. Print.